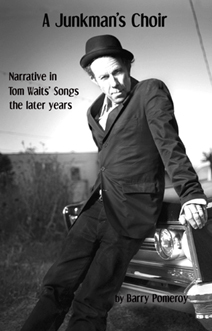 This third volume of my Narrative in Tom Waits' Songs series is an attempt to tell the story of his later period beginning with the dark tapestry of tales and stripped-down guttural roar of blues rock in Bone Machine. Released in 1992, in many ways that album was the hollering inbred cousin who didn't find enough room on Rain Dogs. Within a year The Black Rider tells its listeners-in case we have forgotten from earlier albums-that "There's a lot of things in this world / you're going to have no use for." The anodyne to this is not the roustabout drinking of his earlier period, however, for "when you get blue / And you've lost all your dreams / There's nothin' like a campfire / And a can of beans." The campfire and the can of beans do not cure the world's ills; there is just nothing like them. Like the first two volumes of Narrative in Tom Waits' Songs, I use the lyrics and music to tell the story waiting in the wings to come on, the one that the songs either avoid or never intended to let loose. I use the nightmare calliope of Mule Variations from 1999 and Alice and Blood Money from 2002 to evoke Waits' carnival barkers, inept profiteers, and balladeers to reach outside the wreckage of the personal to peer into the blackened well of those characters' lives. Raising their tangled stories like belladonna in the garden, I hope that the nightmare rides through albums like Real Gone's 2004 seemingly antithetical stories somehow combine with the narrative I am trying to pull out from Waits' exploration of Middle America, with its losses, its joys, and the cars everyone was driving when we went over the cliff.